Mr. Harshana Perera had his primary and secondary education at S. Thomas College Mount Lavinia where he excelled in Academics and Co-curricular activities securing the office of a school prefect in 1991. He was the leader of the English Debating Team, Member of the prestigious School choir and the Western Band. He gained entry to the Law Faculty of the University of Colombo where he read for a Bachelor of Laws degree and was awarded the LLB Degree by the University. He then entered Sri Lanka Law College where he obtained a first class honours pass at the Attorneys final examination. He was awarded the prestigious Sir Cyril de Soyza gold medal for the Address to the Jury competition and was also a member of the Law College debating team. He took oaths as an Attorney at Law of the Supreme Court in December 1996. Mr. Perera is a fully qualified Management Accountant of the Chartered Institute of Management Accountants (CIMA) UK. He passed the final examination of CIMA with distinction being awarded the Angelo M. Patrick prize for the Best Performance in the subject Strategic Management Accounting and Marketing in CIMA Stage IV. He obtained his Masters in Business Administration (MBA) from the Postgraduate Institute of Management of the University of Sri Jayewardenepura in 2010 where he completed a research on Training and Developing Primary School teachers. His dissertation was commended by the Academic Board for its practicality and relevance to the educational sector. He was also the valedictorian of the MBA class. Mr. Perera started his working life as an Industrial Relations Advisor attached to the Employers’ Federation of Ceylon. In this capacity, he worked with many Business Establishments in the private sector offering them advice and consultancy in Labour Law, Industrial relations, Human Resource Development and Company re- structuring. He was also a much sought after trainer of executives. He has presented papers and represented the country at several International Conferences of the International Labour Organization on topics ranging from Occupational Safety and Health to Sexual Harassment at the work place. He has attended International training programmes in Tokyo, Manila, Geneva, Dublin and Penang. Mr. Perera served as the Sub Warden (Deputy Head) of S. Thomas’ College Mount Lavinia from 2002 to August 2011. He was responsible for the management of a tutorial staff of over 150 while being overall responsible for the discipline of a student population in excess of 2500. He gained the confidence of all stakeholders in lifting the standards of both academics and extracurricular activities during his tenure. Mr. Perera was instrumental in re introducing instructions in the English Medium at S. Thomas College which was successfully implemented during his period of office. The capacity of the staff was developed by establishing a dedicated Staff Resource Centre. He was famed for his significant strength in pastoral care and was highly respected by both parents and students for the manner in which he handled issues of education and formation of adolescent boys. Mr Perera also functioned as the Acting Warden of the school on numerous occasions including a period of 10 months in 2008/2009 where he steered the school single handedly. The school consolidated its position as a premier Private Boy’s School offering the National Education Curriculum in Sri Lanka. Mr Harshana Perera was also appointed as an Advisor to the Ministry of Education on Religious Education during this period. Mr. Harshana Perera then functioned as the Chief Operating Officer of Imperial Institute of Higher Education (IIHE) which is the only Institute in Sri Lanka validated by the prestigious University of Wales in the UK. IIHE offers Bachelor’s Degree programmes in Management and Software Engineering and a MBA programme which is considered to be the most recognized MBA offered in Sri Lanka at the time. He was also responsible for introducing the Diploma in Hospitality and Tourism from Institute of Hospitality (UK). This was the first time that this Diploma program was introduced to South Asia. Mr. Perera is credited with having introduced streamlined processes to IIHE in a very short space of time. Mr. Harshana Perera joined Gateway College Colombo in 2013, first as Deputy Principal and then promoted as Principal in January 2014. Gateway College with a student population of 1,800 is one of four schools belonging to the Gateway Group. He gave leadership to a tutorial staff in excess of 150 and spearheaded the activities to make Gateway College Colombo one of the most respected and recognized International Schools in Sri Lanka. The school witnessed phenomenal progress in infrastructure including a New Secondary School Library, a New Swimming Pool, Tennis Court and refurbished Basketball Court during his tenure as Principal. The students also secured many High Achiever Awards and World Prizes at the Edexcel Awards Nights under his period of his stewardship. He was instrumental in building a strong bond of unity among the student body and instilled discipline in a firm, fair and friendly manner. Mr. Perera managed to make Gateway College synonymous with high quality education through a collaborative approach to teaching and learning and persuasive leadership. 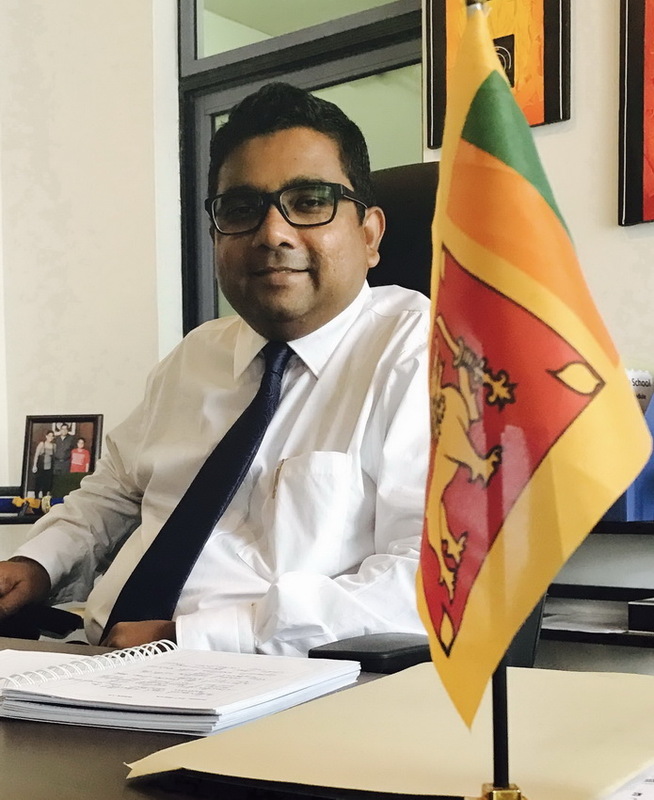 In March 2017, Mr. Harshana Perera took over the reigns as Principal of Asian International School, which boasted of a glorious past as a much sought after International School in Colombo. Mr. Perera undertook the task of rebuilding the school ethos which had suffered as a result of uncertainty and instability in management in the last few years. Mr. Harshana Perera has been able to instill confidence in the school within a very short period of time and has successfully garnered the support of a staff of near 150 teachers to work towards regaining past glory. Priority has been given to Professional Development where CPD workshops are conducted on a monthly basis to equip the teaching faculty with new and innovative approaches to teaching. The school very recently launched the AIS Innovation Centre which was the brainchild of Mr. Perera. This Innovation Lab has been set up in collaboration with Create Lab Singapore and Igniter Space in order to facilitate creative problem solving and improve computational thinking among students. This is the first time that such a facility has been set up in a secondary school in Sri Lanka. The school has also recorded success in extracurricular activities within a short period and several new sports such as Soccer, Karate and Archery have been added to the suite of activities offered. The school also consolidated its position of preeminence in Drama and Debating. AIS is poised to scale further heights under the leadership of Mr. Harshana Perera as the foundation has now been laid for further improvement in both infrastructure and Human Resources. Mr. Harshana Perera also functions as a visiting lecturer in Law and Management, Company Law and Strategic Human Resource Management for the MBA and BSc in Management of the University of Wales offered in Sri Lanka at the Imperial Institute of Higher Education.